Looking for a fun and new decoration to get everyone excited for Halloween? Paper pumpkins are a great way to add variety to your decorations, and they are fun to make as well! 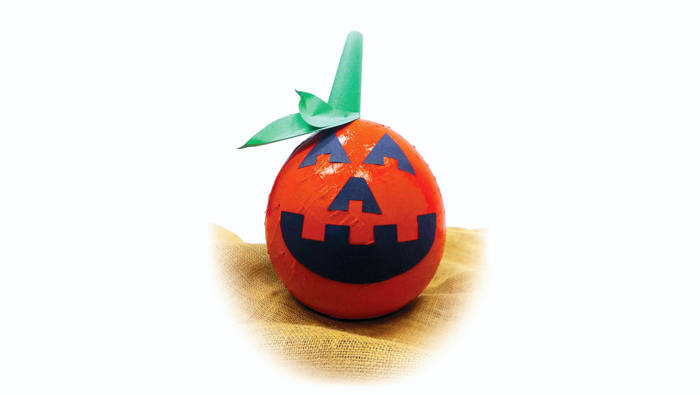 Members, log in below to learn exactly how to make the perfect paper pumpkin. Pour two parts glue and one part water into a large mixing bowl. Stir together until it becomes a thick mixture, the consistency of paint. Step 1: Cut 2-by-10-inch strips of newspaper. You’ll need about 25 strips for each of the 3 layers. Step 2: Blow up one balloon to the size you want your pumpkin to be. Step 3: Dip newspaper strip into papier mâché until it is soaked. Step 4: Wipe excess papier mâché off of strip so it is not dripping. Step 5: Smooth strip vertically on balloon. Step 6: Repeat steps one through five, placing strips slightly over the previous strip. Step 7: Cover entire balloon with one layer of newspaper strips. Let dry. Step 8: Add two more layers by repeating steps one through seven. Step 9: Paint your pumpkin orange with several layers of acrylic paint. Step 10: Decorate your pumpkin with construction paper.